The term “front of the house” refers to any location within a restaurant where customers are allowed. This includes the dining room, bar, and even the restrooms. Management of the front of the house includes customer service, hiring and training staff, stocking and designing the dining room and bar, and planning restaurant promotions. Understanding how the front of the house operates is important to the overall success of any restaurant. Great customer service is key and core to any restaurant's success. Train your front of the house staff to excel at customer service. When the inevitable complaint occurs, be sure that your staff knows how to handle it calmly and respectfully. Also, empowering staff to handle problems as they arise with knowledge and confidence, such as a customer who’s had too much to drink, keeps everyone safe and happy. Actions speak louder than words, and that is certainly true of customer appreciation. There are countless ways you can show your customers how much you appreciate their business. And it doesn’t have to cost you a lot of money (or any money in some cases). For example, personal attention, especially by the owner or manager can go a long way in making customers feel special. There are many different jobs within any restaurant, and every single one, from the owner to the dishwasher, is essential to making a restaurant run smoothly. 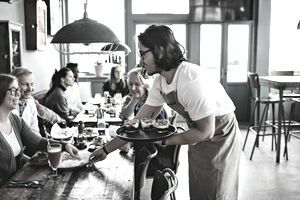 Many think working in a restaurant is easy, but waiting tables, tending bar, hosting, and even properly bussing tables requires special skill sets with which not everyone is equipped. Restaurant personnel who work the dining room and bar need be friendly, organized, and quick thinking. Experience is a plus, but the right person can learn quickly with on-the-job training. The front of the house is the only area customers see, so should consistently reflect the theme or concept of your restaurant. It should be designed efficiently, balancing ambiance with seating capacity. There are many types of promotions and marketing strategies you can use to bring in customers and keep your front of the house busy all year long. Restaurant promotions, whether run daily, weekly, or monthly, are great ways to show customer appreciation and bring in extra business at the same time and can range from a nightly happy hour to an annual customer appreciation day, with drink and dinner specials. From keeping customer service central to your mission, to hiring the right people, to buying the right equipment, a well-organized front of the house will help lay the foundation for a successful restaurant.